Image caption This young man was one of the first people in the world to have a figurative tattoo. It appears as a dark smudge at the top of his arm. Researchers have discovered the oldest figurative tattoos in the world on two 5,000-year-old mummies from Egypt. The illustrations are of a wild bull and a Barbary sheep on the upper-arm of a male mummy, and S-shaped motifs on the upper-arm and shoulder of a female. The discovery pushes back evidence for the practice in Africa by 1,000 years. Details of the tattoos have been published in the Journal of Archaeological Science. Daniel Antoine, one of the lead authors of the research paper and the British Museum's Curator of Physical Anthropology, said that the discovery had "transformed" our understanding of how people lived in this era. "Only now are we gaining new insights into the lives of these remarkably preserved individuals. Incredibly, at over 5,000 years of age, they push back the evidence for tattooing in Africa by a millennium," he told BBC News. 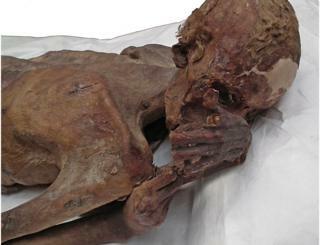 The male mummy was found about 100 years ago. Previous CT scans showed that he was between 18 and 21 years old when he died from a stab wound to the back. Dark smudges on his arm were thought to be unimportant until infrared scans revealed that they were tattoos of two slightly overlapping horned animals. One is interpreted to be a wild bull with a long tail and elaborate horns; the other appears to be a Barbary sheep with curving horns and a humped shoulder. The female mummy has four small S-shaped motifs running down her right shoulder. She also has a motif that is thought to represent batons used in ritual dance. The designs are under the skin and the pigment is probably soot. Previously, archaeologists had thought only women wore tattoos in the ancient past, but the discovery of tattoos on the male mummy now shows body modification concerned both sexes. The researchers believe that the tattoos would have denoted status, bravery and magical knowledge. The mummies were found in Gebelein in the southern part of Upper Egypt, around 40km south of modern-day Luxor. The individuals were buried in shallow graves without any special preparation, but their bodies were naturally preserved by the heat, salinity and aridity of the desert. Radiocarbon results indicate that they lived between 3351 and 3017 BC, shortly before the region was unified by the first pharaoh at around 3100 BC. The oldest example of tattooing is found on the Alpine mummy known as Ötzi who is thought to have lived between 3370 and 3100 BC. But his tattoos are vertical or horizontal lines, rather than figurative.